A great food-year of 2006 has pass with my humble blog seeing two New Years. I once again wish all my readers out there a really Happy New Year. Thank you for your continuous support on this little site from a tham-jiak girl. Looking back at all my food posts, I seem to miss out a lot in my culinary adventures recently. I told J I want to cook again every Sunday (with him rolling his eyes) and I hope I would stick to it. Cook something or bake something. Anything! Relaxing should no longer be a valid excuse for me. I hope this count as a New Year resolution. Truly tham-jiak of me to have a resolution which is food related. I would throw in extra bonus on this resolution that is to live and eat healthier this year, which can be done with more home-cooking, right? While waiting for my so-call more cookings to come (and a belated-nowhere-to-be-seen Bangkok posts), here’s the food we had at the end of 2006 and the beginning of 2007. I was craving for ice creams on the last day of 2006, and J recommended on Baskin Robbins as they have 31% discount promotion for every 31st of any months. So we went to Uptown, which had an outlet there, and first had our dinner in a restaurant few lots away. We pick it cause its nearby, and went in curiously. The place was not crowded, only with a long table of a rowdy huge family. It did spoil the mood a little and we had to wait for quite sometimes for our food to come. 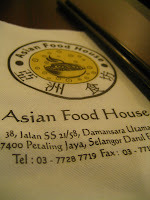 This restaurants serves Korean and Japanese food, with quite a number of choices and the price was reasonable. 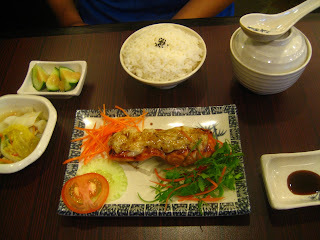 J ordered a Japanese salmon set, which came with soup, vegetable and prawn fritters. The fritters was great but the portion was small, with only two mini prawns. Then the salmon was actually pretty good, tender with a salty cheesy sauce at the top. Next I ordered Korean Kim Chi noodle, but it came not like what I expected. This Kim Chi soup was really thick, remind me of our local Mee Rebus (with grounded peanuts). 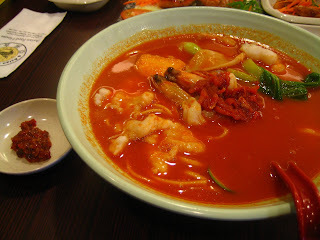 It was still tasty but I would have prefer my Kim Chi the way I had in Haeun Khon Korean restaurant at Amcorp Mall, featured by many bloggers before. Anyway, it satisfy my search for something spicy. After dinner, we head on down to Baskin for our desserts. We then found the shop jam-packed with crazy people like me, thus we decided not to join in the pack. J and I then diverted to Swensen’s instead, for my ice cream craving fix. It has been a long time since I have my chocolate fix, so now I’m craving for some icy chocolate treats. They ran out of their famous chocolate ice cream so I went for the Chocolate Crunch. 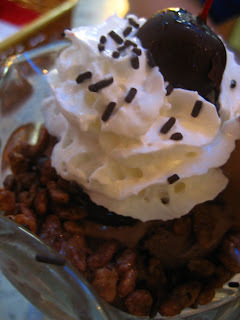 The ice cream was slightly melted, but nonetheless its creamy, chocolatey with crunches of puffed rice cereals. In short, it satisfies my craving till I make my next batch of chocolate heaven. 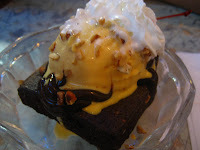 Then J had chocolate brownie topped with ice cream. The brownie was slightly dry to my liking. While eating I was dreaming of baking one extra soft gooey chocolate brownie topped with my own homemade vanilla ice cream. Let’s see when this happens, I’m good for wishful thinking. Anyway, that gives a sweet ending to year 2006 and for ushering in the year 2007, we had a nice late lunch at Esquire Kitchen. This Chinese restaurant had been in Malaysia for quite a long time,with lots of branches and the food is always up to par. It was also featured by Boo before from masak-masak. 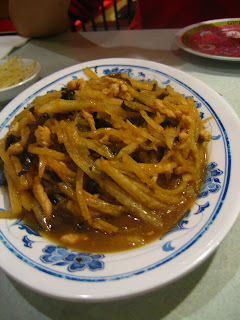 It is also really famous for its steam chicken, but we opt for something else that day. 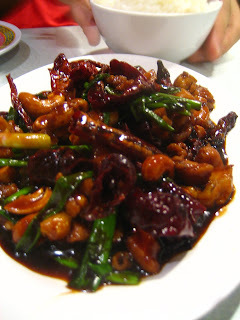 This stir-fry pork strip Szechuan style was really good, with apparent taste of rice wine which I liked. Then this stir fry chicken with paprika was really good too, and I absolutely love the addition of the cashew nuts. Certainly one of their signature dish. We also ordered Siu Long Pao, but it was certainly not recommended by me as it was nothing close to the ones I had in Hong Kong. 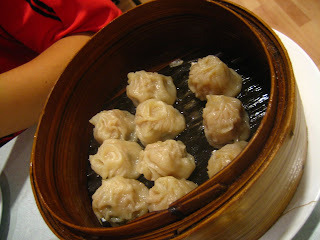 In fact these reminds me of Siu Mai instead, with the absence of the soup. So next time I will stick to the dishes and not their Dim Sums, but their Siew Pao was good too, we had that at other occasions before.